1:5:10:067 Tip: One reason that many people suffer from such severe pollen allergies is that most landscape plants are male and produce pollen. Of course some plants are worse than others. 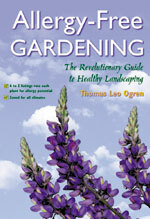 Author Thomas Leo Ogren discusses this and the solutions in his book Allergy Free Gardening.